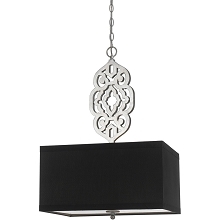 This pendant features a refined mix of contemporary and urban style that creates a charming ambiance for your home. 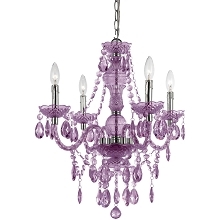 The gold finish is offset but a pink glass shade, adding a bit of fun to a sophisticated piece. Be it an entryway in need of a little illumination, a bedside seeking brightening, or a kitchen island searching for some shine, the versatile Porto pendant is the perfect pick. 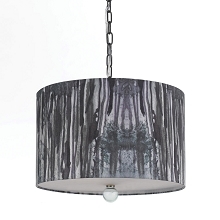 The AF Lighting 8320-3H The Trees Pendant was inspired by the forest and the hand-printed shade is beautifully crafted on poly fabric. 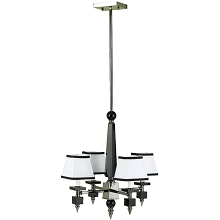 Designed by Deborah Benz this Transitional style pendant features three 60 watt Edison bases (bulbs not included) and an on/off switch. The Swag kit is included and due to hand-crafting no two are alike. 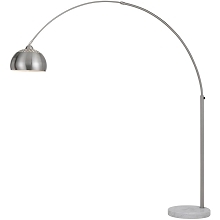 Add an elevated sense of style and comfort to any indoor space with the 8424 floor lamp. 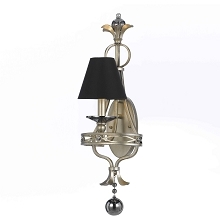 Featuring laser-cut metal frame with an antique brass finish, this charming lamp boasts a unique transitional style. 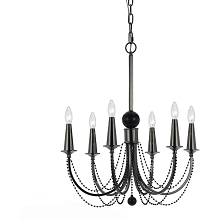 Bring the comfort, style and lighting of your home to the next level with the 6680 4-Light chandelier. 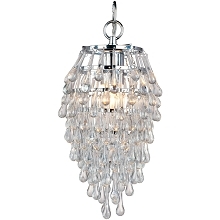 Featuring a sleek chrome finish accented by gorgeous crystal and cream poly silk hard-back shades, this stunning chandelier includes four 60W candle bases and three adjustable poles. This modern chandelier is hard-wire only. 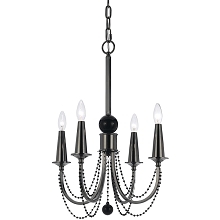 Bring warmth, comfort and style to your home with the 66874-light chandelier. 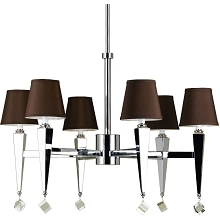 Featuring a sleek chrome finish accented by crystal and chocolate poly silk hard-back shades. 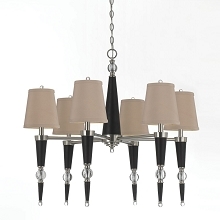 This charming chandelier includes four 60W candle bases and three adjustable poles. 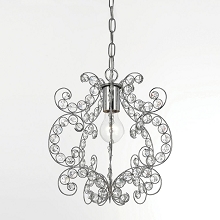 This chandelier is hard-wire only and, due to handcrafting no two models are alike. Although simple in design, this Bellini pendant in brushed gold gives your home plenty of light and has a wonderfully sophisticated look. 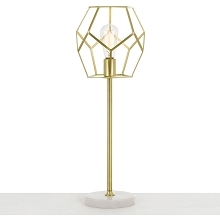 The geometric-shaped light provides a modern, minimalist style in any interior and can be the centerpiece of any space. 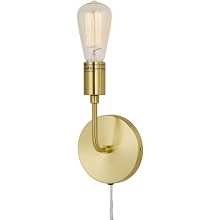 This pendant is versatile and can be hung as a swag lamp or professionally installed as a ceiling fixture with a hardwired connection. 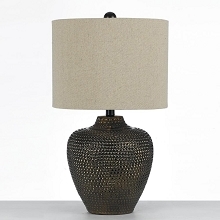 The antique brass finish on the Sinatra table lamp's decorative base highlights the stylish and contemporary design. It's topped off with a black hard back fabric shade to complete the look in neutral style, making an eye-catching addition to your home. 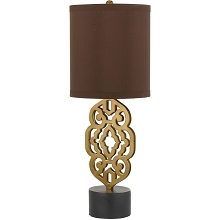 This beautiful conversation piece will enhance your space with style and illumination. 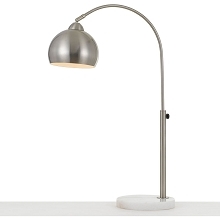 The Derry two-light table lamp is perfect for your home or office. Its understated frame is crafted from metal and features an oil rubbed bronze finish. Both lights are highlighted by an adjustable drum shade head to get the gleam right where you want it. 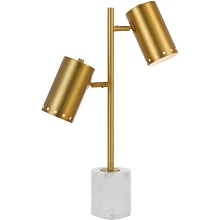 With brass finishes and a marble base this light will add a touch of modern sophistication to any room. 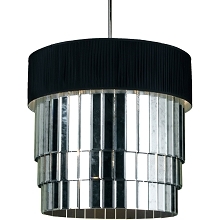 The Odessa hanging pendant features a contemporary linear design with a nod to traditional style. A brushed brass finish paired with the clear glass shades is the perfect accessory for any kitchen or entryway. 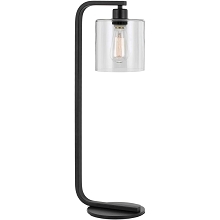 The glass shade of this stylish lamp not only enhances its pleasing and appealing aesthetic, it also adds to the overall durability of this piece creating versatile, ambient lighting. Candle bases accentuate the look and provide a warm glow to any space while adding a touch of sophistication. 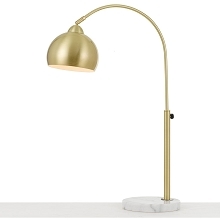 Set on a sturdy tripod base with a shiny finish and dome-shaped shade, the Toulouse table lamp will keep your decor sleek and stylish while providing just the right amount of light for doing paperwork, reading, crafting and performing other daily tasks. 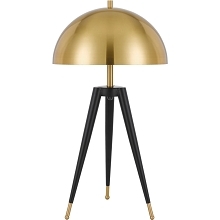 This lamp is the the perfect addition to almost any area, and manages to deliver striking style into any space you put it. Showcase your brilliant taste without sacrificing fashion for function. 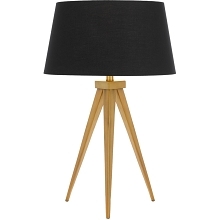 The Derry three-light floor lamp is perfect for your home or office. 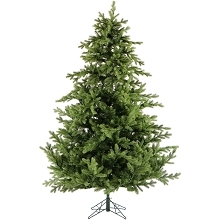 Standing 66 inches tall, its understated frame is crafted from metal and features an oil rubbed bronze finish. Up top, you'll find three lights, each highlighted by an adjustable drum shade head to get the gleam right where you want it. 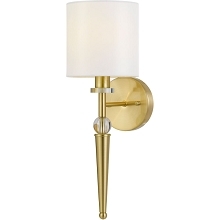 With brass finishes and a marble base this light will add a touch of modern sophistication to any room. The AF Lighting 8112-1H Lola Pendant features white hanging shells with antique brass accents and a natural color gauze hard-back shade. 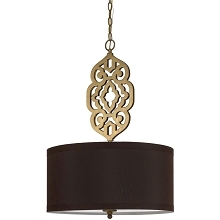 Designed by Deborah Benz, this Traditional style pendant features a 100 watt Edison base and a swag kit. 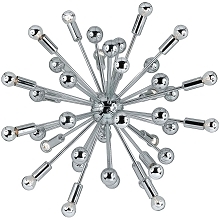 It can be utilized as a plug in pendant or hard wired if desired to customize your lighting needs. 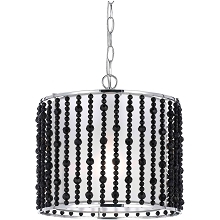 The AF Lighting 7491-1H Spellbound One-Light Pendant features a chrome finish with clear and black glass beads. 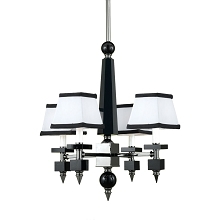 This modern style pendant uses one 60-watt candle base bulb (not included) and includes a swag kit and hard-wire option. Due to handcrafting, no two are alike. 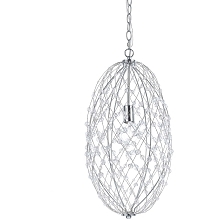 The AF Lighting 8287-1H Tear Drop Silver Web Pendant is playful and functional, accented with randomly placed glass beads throughout a polished chrome frame. Comes with a swag kit so it's easy to use in any space. Also, it features a 60 watt candle base and and can be hard wired if desired. This Modern style pedant is designed by Catherine Smoak, and due to handcrafting no two are alike. We suggest using silver tip bulbs to add additional drama. 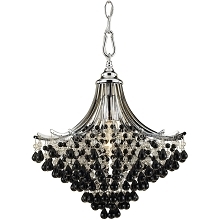 The AF Lighting 8123-1H Crystal Teardrop Chandelier features a chrome finish with black drop glass. 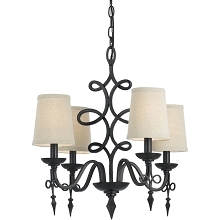 This transitional-style chandelier uses a 100-watt candle base bulb (not included). Swag kit and hard wire options are included, and assembly is required. Due to handcrafting, no two are alike. 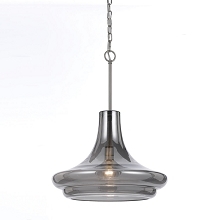 Although simple in design, this Bellini pendant in brushed nickel gives you plenty of light and has a wonderfully sophisticated look. The geometric-shaped fixture provides a home, modern minimalist style in any interior and can be the centerpiece of any space. 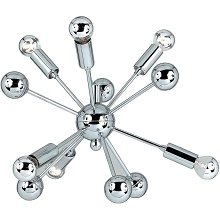 This pendant is versatile and can be hung as a swag lamp or professionally installed as a ceiling fixture with with a hardwired connection. Versatile and functional, the Orb table lamp with metal globe is perfect for providing extra lighting for work or reading. 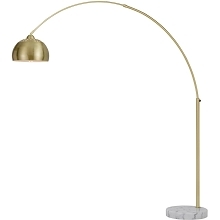 Featuring an adjustable brushed gold pole, you can extend the height for bright and brilliant illumination where you need it. 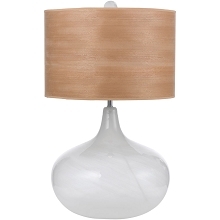 Portable and stylish with a round marble base, this lamp is ideal for any living space. 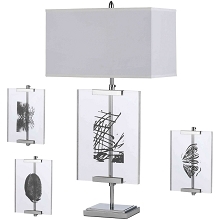 The 8316-TL Easel Table Lamp with Interchange Panels comes with 4 interchangeable screened prints. 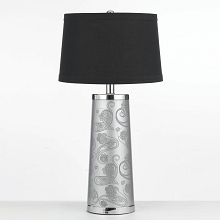 This flexibility allows you to update the lamp depending on the mood of your decor. The lamp is finished in chrome and acrylic resting underneath a white poly silk hard-back shade. 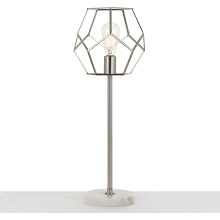 Designed by Catherine Smoak this Modern style table lamp features a 150 Watt three-way Edison base (bulb not included). Due to handcrafting no two are alike. 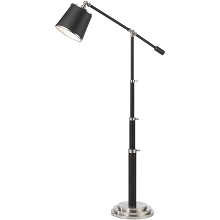 Deliver style and function to any indoor setting with the 7912 floor lamp. 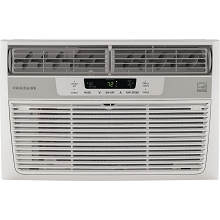 Featuring an adjustable 60 in. 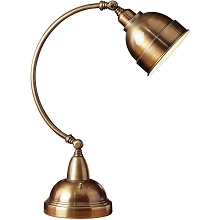 oil-rubbed bronze pole with elegant satin nickel accents, this sophisticated lamp was designed to resemble a nautical telescope and offers an industrial accent to your home or office. The two pivot design provides more control to your direction of light, allowing you to alter it with ease. 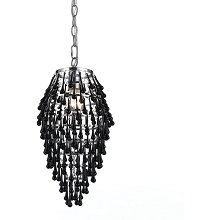 Bring an elevated sense of style and comfort to any indoor space with the 8421 pendant. Featuring laser-cut metal frame with a silver foil finish, this charming design boasts a unique transitional style. 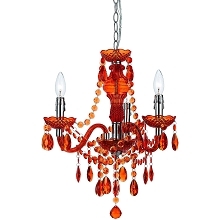 The AF Lighting 8353-4H Naples Four-Light Mini Chandelier is great to use in any décor to bring that pop of color and fun crafted in cut plastic our 4-light mini. Part of the Elements series, it comes with a swag kit, and it can also be hardwired if needed. Dripping with lots of teardrops and beads making this a fun item in your décor. Due to handcrafting, no two are alike. Poly fabric clip on shades (8528-4S) in white sold separately. Some assembly required. The Fizz table lamp is a charming addition to any coastal-themed room or rustic settings. Its elegant silver mercury base is designed with texture, depth, and a glamour finish that is sure to become a stand-out accent piece in the room. 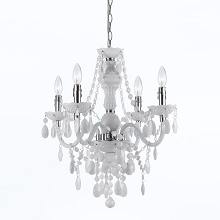 The white linen shade softens the look and the clear acrylic finial is the cherry on top. The Fizz table lamp is a charming addition to any coastal-themed room or beach house. It's teal and clear acrylic base is designed with texture and depth that is sure to become a stand-out accent piece in the room. The soft, white linen shade completes the look and the clear acrylic finial is the cherry on top. 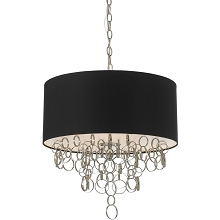 The AF Lighting 8284-1H Small Round Web Pendant is playful and functional, accented with randomly placed plastic beads throughout a polished chrome frame. Comes with a swag kit so it's easy to use in any space. 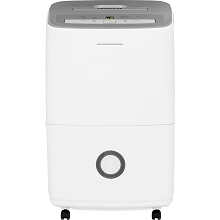 Also, it features one 60 watt Edison base and and can be hard wired if desired. This Modern style pedant is designed by Catherine Smoak, and due to handcrafting no two are alike. We suggest using silver tip bulbs to add additional drama. 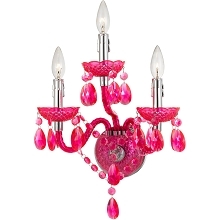 The AF Lighting 8680-4H Naples Four-Light Mini Chandelier is great to use in any décor to bring that pop of color and fun crafted in cut plastic our 4-light mini. Part of the Elements series, it comes with a swag kit, and it can also be hardwired if needed. Dripping with lots of teardrops and beads making this a fun item in your décor. Due to handcrafting, no two are alike. Poly fabric clip on shades (8528-4S) in white sold separately. Some assembly required. 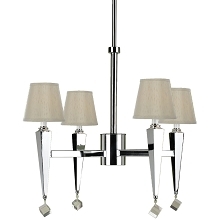 The 8494 table lamp features a chrome finish with accents of crystal. It's adjustable to shine light when and where it's need. 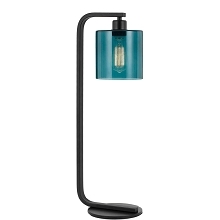 This modern table lamp uses a 60 watt bulb (not included) and has a on/off switch. 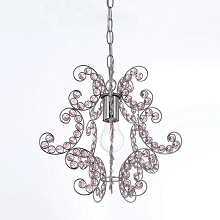 It's an exclusive design for AF Lighting and due to handcrafting, no two are alike. 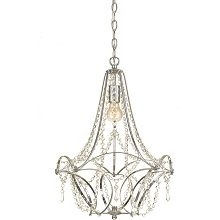 Although simple in design, this Bellini one-light chandelier in brushed nickel has a wonderfully sophisticated look. 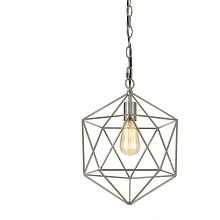 The geometric-shaped light provides elegant minimalist style in any interior. 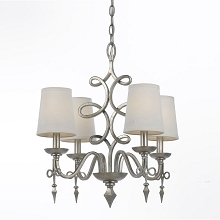 This chandelier is versatile and can be hung as a swag lamp or professionally installed as a ceiling fixture with a hardwired connection. 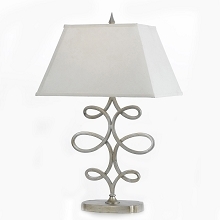 Accentuate your modern style with the Bellini table lamp in brushed nickel. 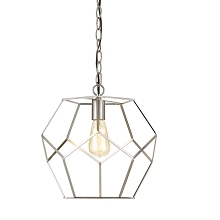 The geometric metal wire shade allows plenty of light to come through while adding airy sophistication to any room while the marble base balances it out with a touch of tradition. With the elegant, minimalist style, this fun and fashionable piece would be perfect in a modern bedroom or office. 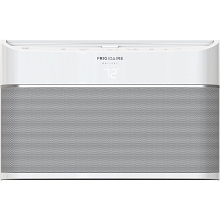 The Bellini Collection offers clean lines and mathematical style that's quintessential for any contemporary home. Illuminate your home with the Sheridan wall sconce from AF Lighting. 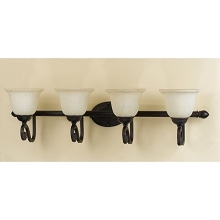 This sconce provides the perfect blend of style and function; perfect for lighting up any hallway, entryway, and vanity. The frame is covered in a beautiful chrome finish that integrates well with existing color schemes. Two crystal ornaments are located in the center and bottom of the base. When the light is on, these crystals create a beautiful prismatic effect as the light shines through. 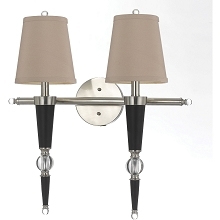 The sconce is topped off with a square hardback shade in beige to complete the look. 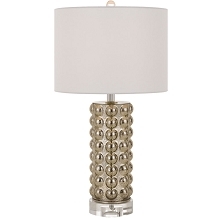 Accentuate your modern style with the Bellini table lamp in brushed gold. 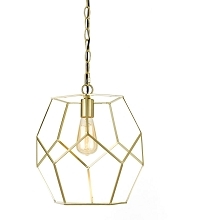 The geometric metal wire shade allows plenty of light to come through while adding airy sophistication to any room while the marble base balances it out with a touch of tradition. With the elegant, modern minimalist style, this fun and fashionable piece would be perfect in a modern bedroom or office. The Bellini Collection offers clean lines and mathematical style. The 8702 2-light sconce is crafted in square metal finished with a hand-applied glint finish making this a statement in any décor. The over-sized candle sleeves and accents of smoke crystal and topped off with hard-back poly cotton black shades make this a great look. 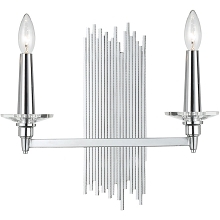 This transitional style sconce uses two 40 watt candle base bulbs (not included) and is hard-wire only. It's an exclusive design for AF Lighting and due to handcrafting, no two alike. 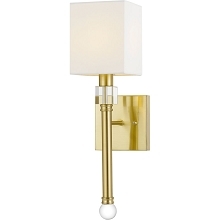 Illuminate your room with the Aurelian Single Wall Sconce. 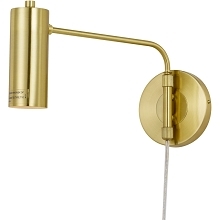 This sconce's gold finish complements the aura of your contemporary home decor. 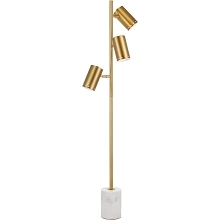 It's also constructed from metal, which is sturdy and durable, and the gold shade adds interest and completes its unique style. 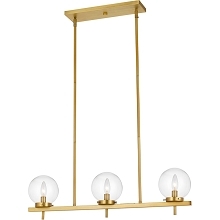 This piece is perfect for adding more light to your room as you read, or adding a pop of gold to any living space. 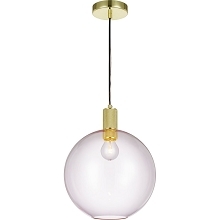 The AF Lighting 8698-1P Prism Pendant is hand blown glass in a smoke iridescent finish. 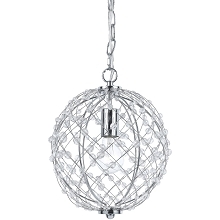 Our pendant comes with hard-wire instructions and an on/off line switch. 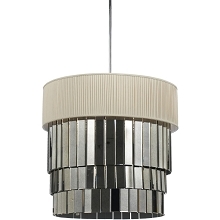 This transitional-style pendant takes a 60-watt bulb (not included). Due to handcrafting, no two are alike. 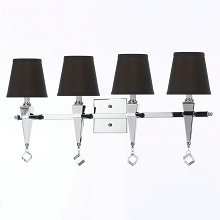 The AF Lighting 6130-2P Wentworth 23-In. 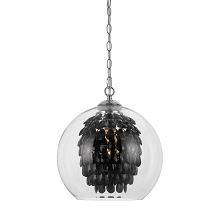 Island Pendant Fixture features a bronze crackle finish with roped pewter accents and cream alabaster glass. 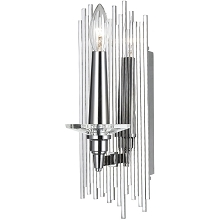 This transitional style fixture uses two 60 watt bulbs (not included) and is hard-wire only. It's a great part of the Elements series, and due to handcrafting no two are alike. 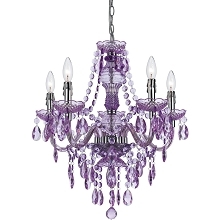 Impress your guests with the wildly-stylish 6685 6-light crystal chandelier. 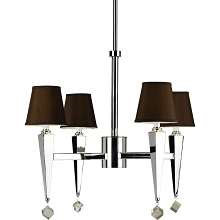 Featuring a modern chrome and crystal finish with chocolate poly silk shades, this charming chandelier will deliver warmth, light and elegance to any indoor setting. 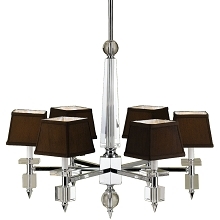 It includes four 60W candle bases and three adjustable poles and makes a great addition to the AF Lighting collection. 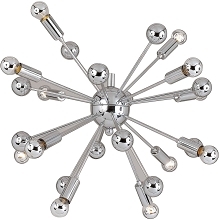 The AF Lighting 5694-20H Supernova Twenty Light Chandelier features a polished chrome finish with twenty silver tipped 40 watt bulbs included. Also, its design features a central sphere, which has slender bulb arms coming out of it. The dimmer enables you to adjust the brightness of the chandelier’s light to suit your preference. This modern style chandelier is hard-wire only. Assembly required. 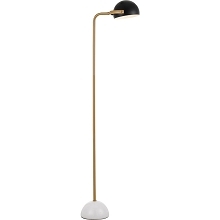 Versatile and functional, the Orb floor lamp with metal globe is perfect for providing extra lighting for work or reading. Featuring an adjustable brushed nickel pole, you can extend the height for bright and brilliant illumination where you need it. 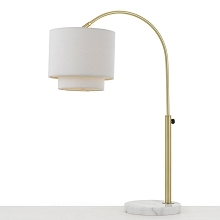 Portable and stylish with a round marble base, this lamp is perfect for any living space. 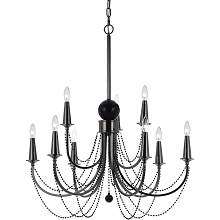 Bring the comfort, style and lighting of your home to the next level with the 6779 6-light chandelier. 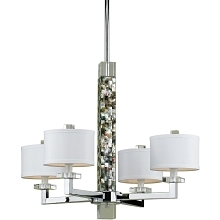 Featuring a sleek chrome finish accented by gorgeous crystal and brown poly silk shades, this stunning chandelier includes six 60W candle bases and a 3 ft. adjustable pole. 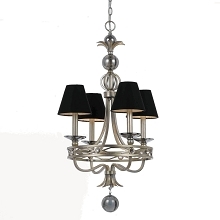 The 8700 6-light chandelier is crafted in sleek metal finished with a hand-applied glint finish making this a statement piece in any room. The over-sized candle sleeves and accents of smoke crystal and topped off with hard-back poly cotton black shades make this a great look. 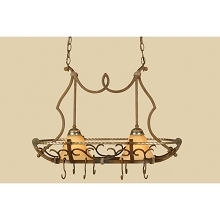 This transitional style chandelier uses six 40 watt candle base bulbs (not included) and is hard-wire only.It's an exclusive design for AF Lighting and due to handcrafting, no two alike. 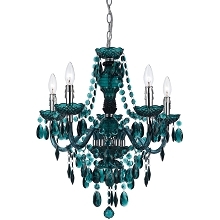 The AF Lighting Fulton Mini Chandelier is a great way to bring vivid color and style to any indoor setting.This sophisticated three-light chandelier is sure to deliver warmth and comfort to any room in your home. 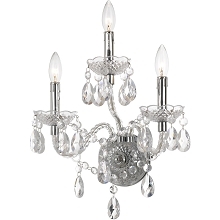 Its beaded design is bright and durable, and the chandelier's metal frame is finished in a sleek chrome. 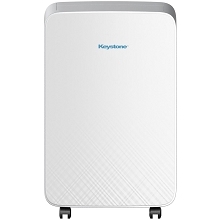 It can be hard wired or plugged in to best suit your needs. Each chandelier is hand-crafted, so no two are alike. 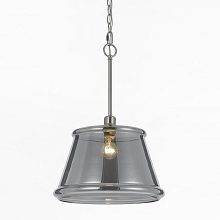 Bring an elevated sense of style and comfort to any indoor space with the 8422 pendant. Featuring laser-cut metal frame with an antique brass finish, this charming design boasts a unique transitional style. 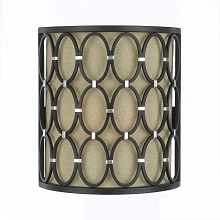 The 8219 wall sconce features an oil rubbed bronze overlay with a circular weld pattern. Each circle is bound to the next with silver accents that add to the industrial appeal. This metal overlay is perfectly complimented by the linen shade insert. 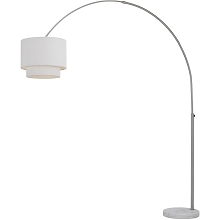 Versatile and functional, the Arched table lamp with fabric shade is perfect for providing extra lighting for work or reading. Featuring an adjustable brushed nickel pole, you can extend the height for bright and brilliant illumination where you need it. 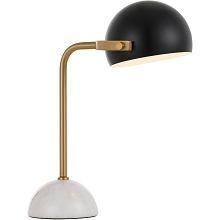 Portable and stylish with a round marble base, this lamp is perfect for any living space. Illuminate your home with the Sheridan wall sconce from AF Lighting. 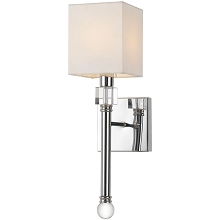 This sconce provides the perfect blend of style and function; perfect for lighting up any hallway, entryway, and vanity. The frame is covered in an elegant satin nickel finish that integrates well with existing color schemes. Two crystal ornaments are located in the center and bottom of the base. When the light is on, these crystals create a beautiful prismatic effect as the light shines through. 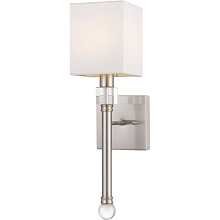 The sconce is topped off with a square hardback shade in beige to complete the look. 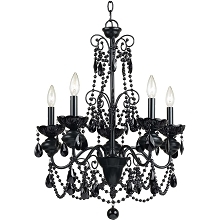 The AF Lighting 7506-5H Mischief Five Light Chandelier has a black metal frame with intricate scroll work, and black glass beads that hang from silver chains. It uses five 60-watt candle base bulbs (not included) and is hard-wire only. 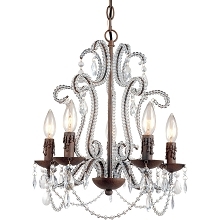 This traditional-style chandelier is part of the Elements series, and, due to handcrafting, no two are alike. Simply assembly is required. The 7933-TL Playa Lamp features hand blown glass swirl in ocean foam.This exclusive Deborah Benz Design is handcrafted so no two are alike. It's complemented by a wood veneer hardback shade that harkens the smooth and flawless intricacies of driftwood. This transitionally styled lamp is part of AF Lighting's Horizon Series, a collection of contemporary, on-trend designs that have been creatively fashioned by fresh designers. 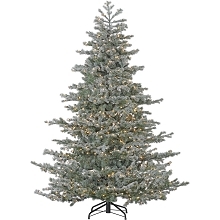 It uses a three-way 150-watt incandescent bulb (not included), and it measures 27 inches tall and 16 inches deep. 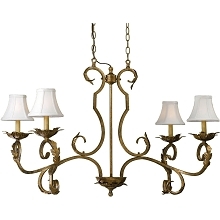 Nothing is quite as elegant as the 3-light wall sconce from the Naples Collection. 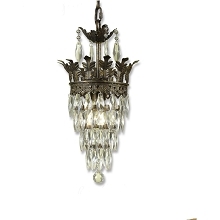 With its sleek, chrome finish dressed in acrylic beads and ornaments, this wall sconce will add an elegant sparkle to and room or hallway it's placed in. The sloped chrome arms and acrylic candle discs dangle a chain of beads and ornaments that lend a special atmosphere in any home. 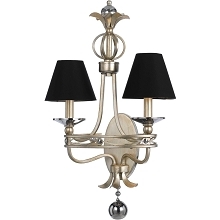 Pair this sconce with other pieces in the Naples Collection to give the interior a luxurious style and feel. 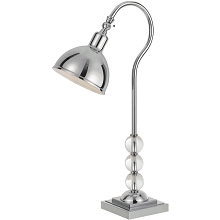 Versatile and functional, the Orb table lamp with metal globe is perfect for providing extra lighting for work or reading. Featuring an adjustable brushed nickel pole, you can extend the height for bright and brilliant illumination where you need it. 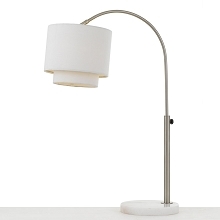 Portable and stylish with a round marble base, this lamp is ideal for any living space. 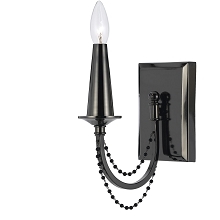 The 9011 wall sconce features hand-applied, silver glint finish accented by smoke crystal spheres and topped with a black poly-cotton shade. 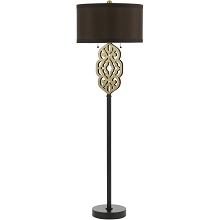 With a transitional style, it is designed with a 60W candle base (bulb not included). It is handcrafted so no two are exactly alike. 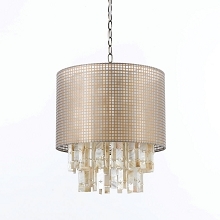 It's an exclusive design for AF Lighting and is a great addition to your décor. The 6909-4WB Harmony Four Light Vanity features a oil rubbed bronze finish with frosted alabaster glass. This traditional style vanity uses four 60 watt bulbs (not included) and is hard-wire only. It's a part of the Elements series and a great addition to the Harmony collection. Due to hand-crafting no two are alike. 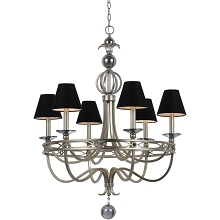 Both sophisticated and inviting, the 6735 4-light chandelier features incredible organic detailing and a handcrafted premium finish for a rich, traditional appearance. Other highlights include an antique gold foil finish, four soft back linen shades and an adjustable 12 ft. chain.